This may be one of a kind Boba Fett proof card. This card was supposed to be the backcard of the imfamous rocket firing Boba Fett. 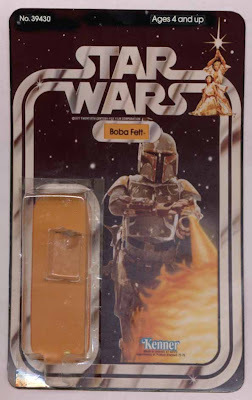 Image comes from Kim Simmons, who did the great photography job on the vintage Kenner and later Hasbro Star Wars items. Image courtesy of Kim Simmons. It seems this is the same proof, that was used for the 1979 Toy Fair Mock up. Have a look at the upper part of the mock up card and you´ll notice that the "Caution" line was touched up with black marker.